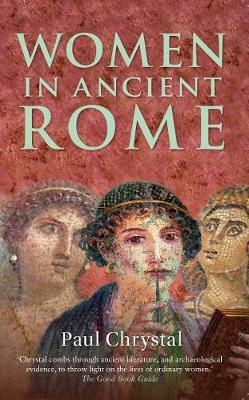 The history of women in ancient Rome is fascinating and exhilarating. It gives a unique insight into one of the world's most dynamic, successful superpower civilisations and illuminates a considerable number of admirable, exciting, evil, slatternly and dangerous women fighting to be heard and seen against insurmountable odds in a world run by men for men. `Silent' is a word that is sometimes used to describe these women, because of the paucity of their own first-hand evidence for their lives; `silent' can also be used to describe how the typical Roman male liked his women. Some women, though, broke that silence and forged an identity of their own in a largely suspicious, paranoid, patronising and critical world. It is those women whom we meet in this intriguing book. Paul Chrystal examines aspects of the Roman woman's lifestyle and her evolving role in the family. We meet the assertive, brave, pernicious and outrageous women in the public arena; we learn about women's education and of artistic, cultured women; we meet women soothsayers, witches and ghosts; we examine the role of women in religion and in the mystery cults. We learn of women as health professionals; women's medicine; women's sexuality; woman as mistress, prostitute and pimp.